The extraordinary archaeological city of Pompeii, the ruins of Herculaneum, Oplonti, the recent ones of Somma Vesuviana, Villa Regina in Boscoreale, Terzigno, the sumptuous 18th century villas of the Golden Mile, the Vesuvius large farms and the barrel roofs of Terzigno, the Antiquarium of Boscoreale, the MAV (Virtual Archaeological Museum) in Herculaneum, the lavas in permanent exhibition of Creator Vesevo, along with the climb to the Gran Cono, the Railway National Museum of Pietrarsa in Portici, where the first Italian track was built by the Bourbons to make the nobles’ journey to their villa more comfortable, Torre del Greco Coral Museum, the Peasant Museum of Somma Vesuviana once again tell a story of intertwining and interactions between man and the volcano, which is also reflected in the flavours, trades and traditions of these places. Inserted in the list of UNESCO World Heritage Site together with the ruins of Pompeii and Oplonti since 1997, this area was discovered by chance in 1709. From that moment on, excavations began and brought to light a significant part of the ancient Herculaneum, a city buried by the eruption of 79 AD. The lahars and the pyroclastic flows of material, which, with their high temperature, have carbonized all the organic materials like wood, fabrics, food, have actually allowed to reconstruct the life of that time. Among others, the Villa dei Pisoni is very famous. Better known as Villa dei Papiri, it was brought to light with the modern excavation of the 90s, during which papyri that preserve the texts of Greek philologists in Herculaneum were found. 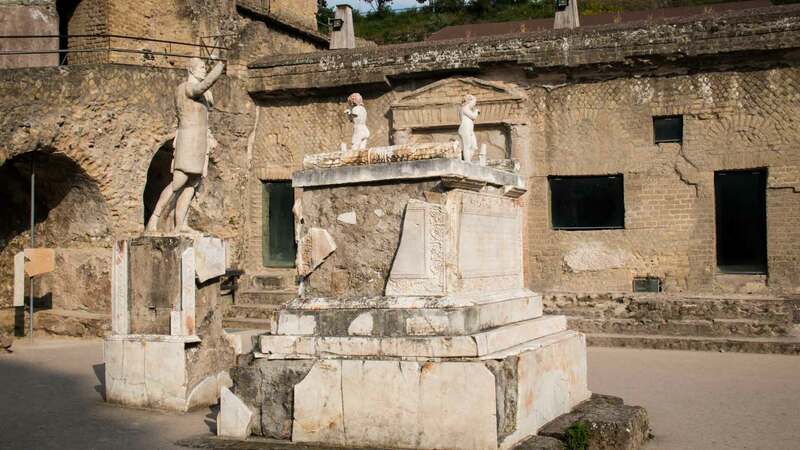 It is a completion and integration of the visit to the ruins, it collects artefacts and statues of the Roman cities of Pompeii and Herculaneum. 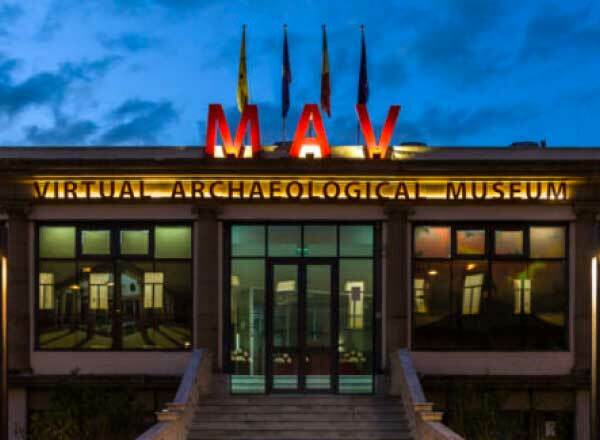 The MAV is not too far from the archaeological excavations of the ancient Herculaneum. It’s a centre of culture and technology applied to cultural heritage and communication, among the most avant-garde museums in Italy. There is a unique and extraordinary museum space inside: a virtual and interactive path where you can experience the thrill of a surprising journey back in time up to a moment before the Plinian eruption of 79 AD destroyed the Roman cities of Pompeii and Herculaneum. Over seventy multimedia installations bring the main archaeological sites of Pompeii, Herculaneum, Baia, Stabia and Capri back to life and splendour. Through scenographic reconstructions, visual interfaces and holograms, the visitor is led into a virtual dimension, where they can experiment in a playful and interactive way the new opportunities that multimedia technology offers to the archaeological heritage. The MAV is a didactic and cognitive place, where the real and the imaginary meet to create new ways of learning and entertainment. 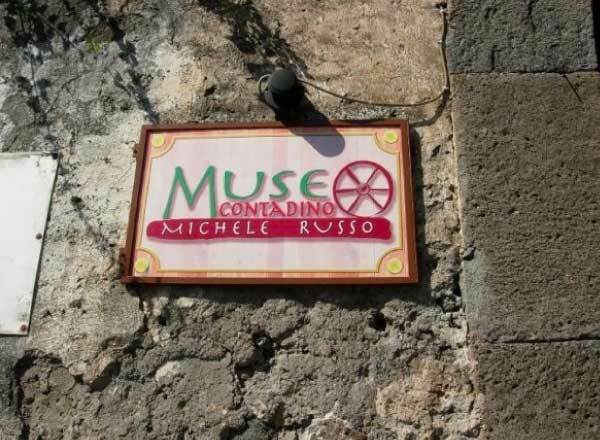 The museum is located in an area of ​​5,000 square metres on 3 levels in the heart of Herculaneum, near the main tourist attractions of the city: the archaeological excavations, the famous vintage market of Resina, the Vesuvius National Park and the Golden Mile, the stretch of coast at the foot of the volcano, along which there are splendid eighteenth-century villas, valuable examples of the Neapolitan baroque style. Thanks to the archaeological findings from the excavations of Pompeii, Herculaneum, Oplonti, Stabia, Terzigno and Boscoreale, the naturalistic and landscape reality of the Vesuvius territory and the way of life of the Vesuvius populations in the Roman era are reconstructed. The site is located in one of the most interesting areas from an agricultural point of view. It is flat and slopes gently north towards Campania’s plain. It is about 50 metres above sea level, but when the gentle sea breeze of the afternoon blows, it seems to be much higher up. It is as if it were on the seashore while not seeing it. The soils are sandy enough to make them soft and permeable for the thickness of about two metres, which are necessary for tree crops. 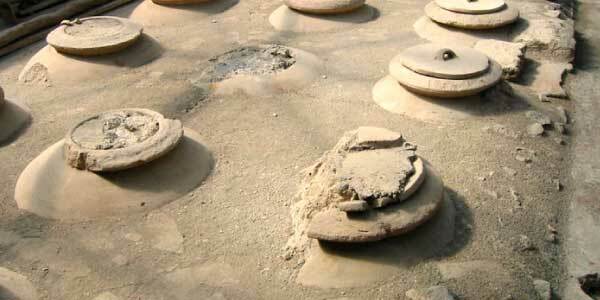 They’re made of the fallen materials of the eruption of 1631 mixed with silt for leaching. Below you can find the materials of the eruptions of 530 and 472, but always with a slight superficial thickness of silt that is very useful for the deepest roots. It’s the fertile land of especially deep root Catalanesca and red vines, but it’s good for almost everything: giant apricot trees, but also monumental cherry trees. They’re all dry crops, but you don’t even notice them in August. Until a few decades ago (since the arrival of agricultural machines that have enlarged the planting pattern), it looked like an “agricultural forest” because nature was so thick, rich and luxuriant. The Angevins and the Aragoneses had a secret summer residence (Starza della Regina) there, which gave high-quality wine, fruit and vegetables. 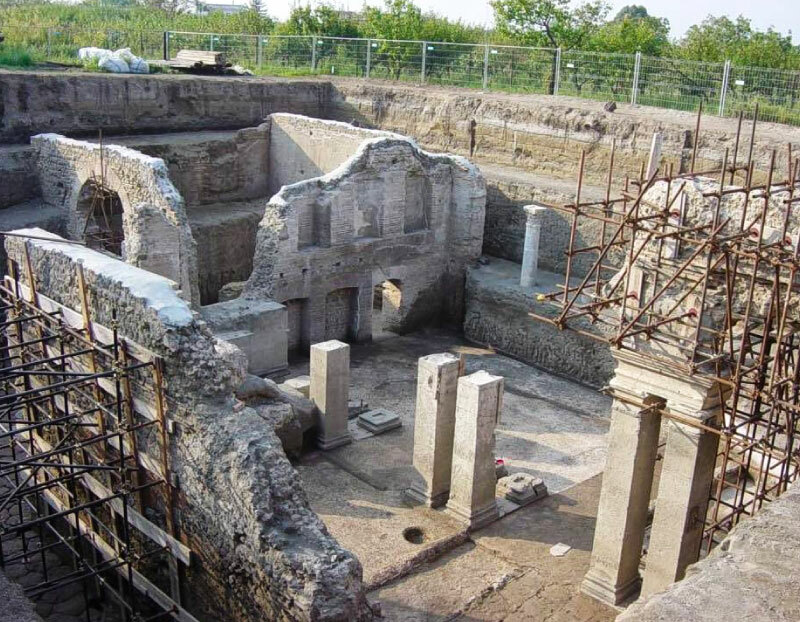 The Villa was built after the eruption of 79 AD, around 120 AD, just after the vegetative revival of nature devastated by earthquakes caused by one of the most violent eruptions of ancient history. The area must have included a drinking water point or some springs nearby because a large cistern is coming to light. But this is demonstrated even more by the proximity of the Augustan Aqueduct (about two kilometres) that probably took water from this site. The view must have been amazing. A spring (or more springs?) upstream were regimented in a large cistern that fed the villa (or the villas?) and a conduit (or a canal?) that from here, descending to the valley, crossed the main channel of the Augustan Aqueduct (in the gallery) which from Serino brought water to the Piscina Mirabilis. The work of nature and the work of man were together in a landscape from earthly paradise. The Villa Augustea presents decorations related to the cult of Dionysus and Pan with bunches of grapes and vine leaves and statues everywhere. After being abandoned by its wealthy owners (around the 3rd century AD), it became a large winery. It was probably the forerunner of Campania’s great cellars for its size and production capacity. At the moment, it represents the largest industrial wine plant discovered in Italy. Everything was destroyed by the eruption of 472 AD. In addition to destroying the villa, this other devastating Vesuvius eruption changed the geographical features of the whole area. 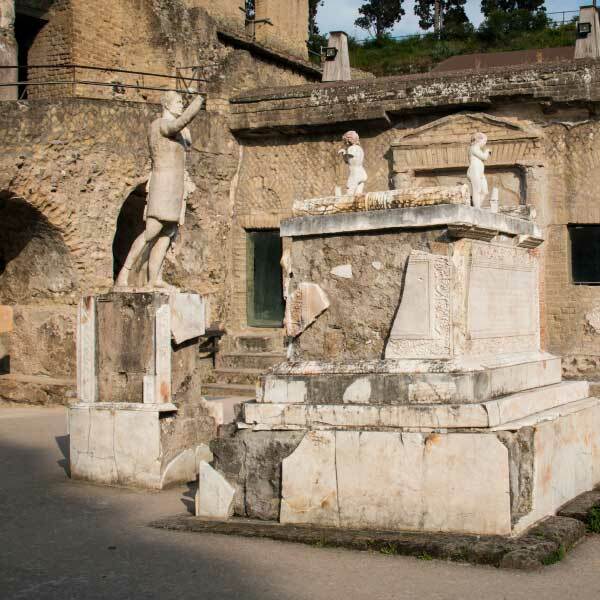 The springs disappeared, the cistern drained, the flow rate of the Augustan Aqueduct at the time (472) was modified. Everything was devastated by tens of metres of thick mud. All its beauty was completely buried and without any witness. The recovery work is just beginning. Housed in the ancient cellars and in the garden of the monumental complex of S. Maria del Pozzo in Somma Vesuviana, the Museum has a collection of about 3,200 pieces as an important evidence of rural culture from 1050 up to the present day. The exhibition path is organised with a focus on the five senses. All the objects of the exhibition are used by artisans and peasants who, in events and exhibitions, revive the ancient crafts. The visit is completed with two other interesting aspects of the life of the farmer in the outer space: the vegetable garden becomes an orchard and a portion of it is used for medicinal, and aromatic plants and the animals are divided between barnyard and cargo animals. It is the first structure in the world that was created to study the volcanic phenomena in 1841 by Ferdinand II of the two Sicilies. 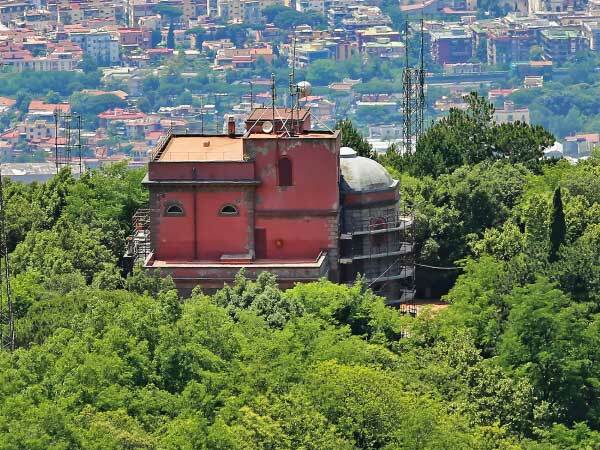 The historic building in neoclassical style, surrounded by a garden with the vegetation of the Vesuvius area, preserves and exposes the scientific instruments and objects left as a gift from a centuries-long survey work. It also hosts “Vesuvius: 2000 years of observations”, an exhibition that collects films, iconographic material and products of volcanic eruptions as well as allowing real-time observation of seismic and geochemical data recorded by the Observatory monitoring network. The Library collects bibliographic material concerning volcanology, seismology and meteorology, but also palaeontology and botany, a collection of periodicals and monographs. It is a unique reality of its kind, a museum of modern and contemporary art. The Museum is a permanent private institution that is run by a non-profit organization which implements the purposes expressed in art. 8 of the Regional Law n. 12 of 2005. It was founded by the international artist Salvatore Emblema to create in his country of origin, Terzigno, and on Mount Vesuvius, a place of inspiration, a space dedicated to education, study and dissemination of contemporary art. The Ministry of Cultural Heritage and Activities and Tourism defines the museum as one of the rare examples of House-Museum in Italy and is a Museum of Regional Interest. You can visit the artist's studio, the man of the Vesuvius, among the most appreciated artists of the ‘900, so much to have worked with Mark Rothko and with the sisters Fontana and Federico Fellini and has been included in the Manual of History of Art by Carlo Giulio Argan.